Familiarity on the part of all the judges with the long saga of the campaign to improve Salisbury Market Place meant that there was no need to spend time visiting it. The judgement that had to be made was whether what had been achieved went beyond what ought to be expected, and the conclusion was that it did. The fundamental decision to remove all parking, from both market place and the Guildhall Square, was applauded as one which had taken some courage, but which had enabled the kind of thorough-going upgrade which the space had desperately needed. The repaving work had been well-executed, using materials which looked right, and which ought to prove durable. Other new elements are relatively low-key, not surprising given the tortuous process undergone after the original Salisbury Vision scheme foundered, but they are well-judged, and play their part in restoring Salisbury’s major secular space to its rightful status within the public realm. The judges felt that the stone structures on the northern edge of the space worked well as they were, and they did not support the addition of painted farm animals etc, as has been proposed. 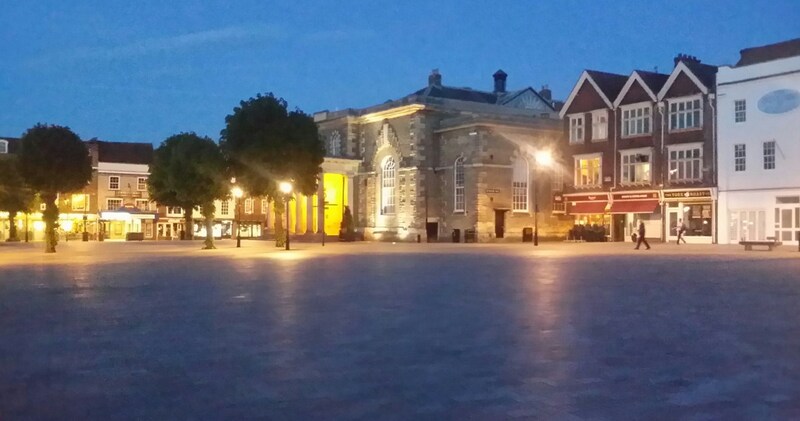 The project did not extend to finding extra ways of utilising the market place in its new uncluttered form, but it did perform an absolutely vital role in making such use a possibility, after the years when parked cars marked the limit of Salisbury’s ambition once the market traders had left.